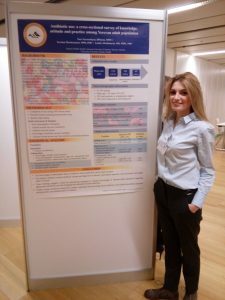 Vienna, Austria – An alumna of the American University of Armenia (AUA) School of Public Health (SPH) Nare Navasardyan (MPH 2016) was competitively awarded a Short-Term Conference and Travel Grant by the Galouste Gulbenkian Foundation to attend the ASPHER Young Researchers Forum, a pre-conference event of the 9th European Public Health (EPH) Conference, which took place in Vienna, Austria, November 9 to12, 2016. This Forum gives a unique opportunity to young researchers to present their work to representatives of the European public health community. 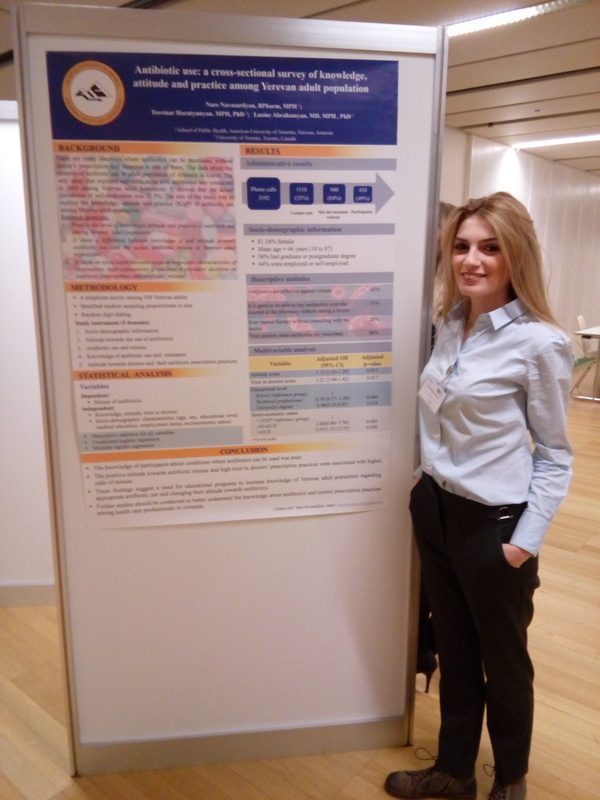 During the Young Researchers Forum, Nare Navasardyan made a poster presentation of her master thesis project “Antibiotic use: a cross sectional survey of knowledge, attitude and practice among Yerevan adult population” co-authored by Drs. Tsovinar Harutyunyan and Lusine Abrahamyan. The ASPHER Scientific Committee competitively selected 21 abstracts for poster presentations and 8 for oral presentations from Armenia and the European Union countries. After earning her Master of Public Health (MPH) degree, Navasardyan has been competitively selected for the position of Research and Development specialist in the “Tonus-Les” pharmaceutical company. Prior to that she worked in the National Tuberculosis Control Center of the Ministry of Health as a Monitoring and Evaluation Specialist. While a student in the MPH Program, she was engaged in a qualitative research for the Nursing Project conducted by Center for Health Services Research and Development of the AUA School of Public Health. The AUA School of Public Health works actively to improve population health and health services in Armenia and the region through interdisciplinary education and development of public health professionals to be leaders in public health, health services research and evaluation, and health care delivery and management.